The Lowbrow Customs Solo Seat Pivot is made right here in Cleveland, Ohio. Heavy-duty steel black powder coated for a beautiful finish paired with custom-made, chrome plated mounting hardware and a raw, mild-steel, weld-on pivot block that is coped for a 1.25 inch diameter frame backbone. You can easily open up the radius of the pivot block with your grinder to fit other diameter frame backbones, or cut if off flat if welding to a flat mounting surface. The design of this solo seat pivot is such that it allows your seat to sit down nice and low to your frame's backbone, tucking it in nice and tight. 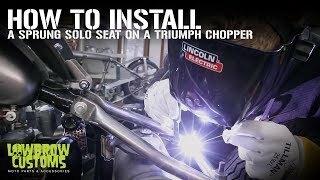 Pair this with your choice of solo seat, solo seat weld-on spring mounts and a pair of seat springs and you can have your seat mounted quickly, easily and professionally! Made in the USA.